I'm taking some time off starting next week. I've been blogging non-stop since January. It's been a very busy period, more so than any other time since I created the blog back in 2010. I need to take some time off to focus on many things, mainly my PEPLUM TV channels. I've undertaken a lot since my last break: new Youtube channels, THE SINNER fotonovela, reviews, etc. All of these things will resume after the break, including THE SINNER serialization. I'm not abandoning it. Articles will still be posted while I'm away (wait and see). Daily views for the blog have grown exponentially, which is good but also not so good in that I feel that I need to work more now. It gets 2000 views a day! Add this to the Twitter, Facebook, Google+, Pinterest and Tumblr views and the daily views reach nearly 8000 a day! Twitter alone gets nearly 2000 impressions a day. One of the negative aspects of higher views is more spamming. If you look at the left hand side, at the most popular posts, the 'Then & Now: Paola Pitti' one is quickly gaining ground. Why? 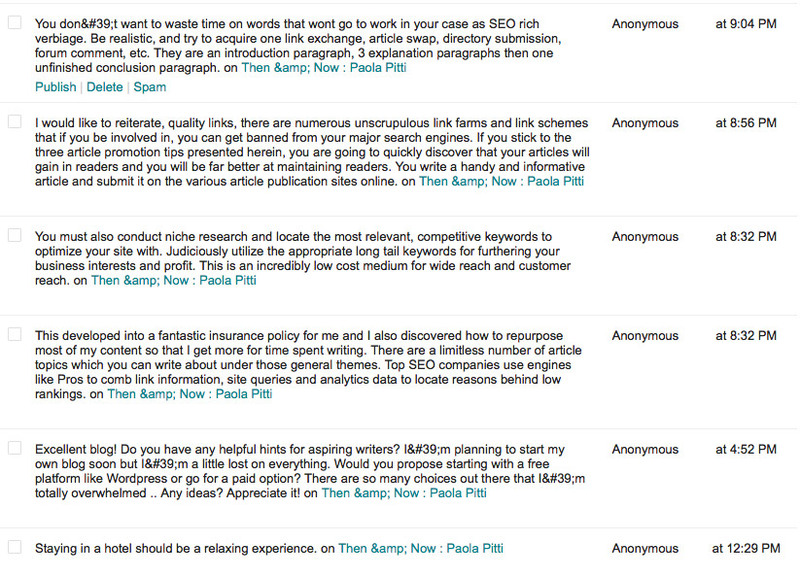 I dunno but that post is being bombarded by spam on a daily basis, even with the blogs spam filter on. It's the most bizarre thing ever! See below for examples of this spamming. Since all of this is a one-man show, I'm thinking of maybe finding someone to assist me. The issue is money, of course. And control over content, which I like to have. All my Youtube channels are going great, certainly the main one. The stats are amazing. My new 3 channels, PEPLUM TV RETRO, PEPLUM TV WORLD and PEPLUM TV FIRE & SWORD are doing good. Unfortunately, while I created these new channels, Youtube changed their policies making it harder to have a fully certified and monetized channel. One of the prerequisites: a channel needs to have over 1000 subscribers to be even considered (and then it still might not be accepted). Because of this there's some delay in uploads and stuff (even though I've uploaded tons since their initial creation). The list of titles blocked or claimed by others on Youtube is an issue. For example, I've wanted to upload some movies for Easter and most of the titles which deal with the reincarnation of Jesus are blocked, claimed or not available. I'm trying to find alternatives. Dailymotion doesn't seem to gather many visitors so that might not work in the long run. There's something called BitChute, which is a 'peer to peer' site that can be viewed like Youtube. The site is still in the process of trying to figure out how to run things so I'll wait until things are legit before joining them (if ever). There are additional frustrating things about Youtube, aside from their crazy policies these days everyone hates. One of the most frustrating thing is finding 'dead' Youtube channels (it's literally a cemetery out there), abandoned for a long time (maybe due to the fear of getting strikes) and a lot of these dead channels always have one or two PEPLUM movies which have garnered amazing number of views. This makes my task in uploading original 'new' content that much harder since dozens and dozens of 'dead' channels have these titles already monopolizing viewership. One such 'dead' channel has GOLIATH & THE SINS OF BABYLON with over 5 million views. Why bother uploading it to my channel, right? Well, no. 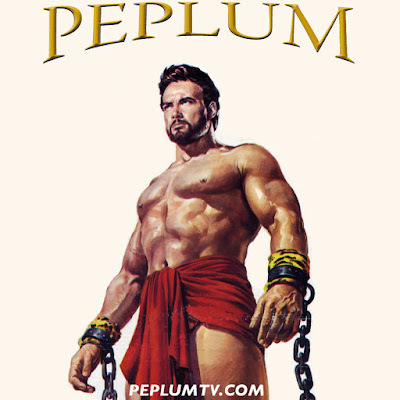 I think of my channels as one-stop place where everyone can view movies under the PEPLUM TV brand. Also, I try to upload the best quality available (with Fan Dubs and stuff) so I can still have an edge over them. The problem really (and this really irks me) is that those dead channels uploaded specific titles when movies weren't blocked but have become blocked since, meaning I can't upload titles because claims / copyrights have changed so often in the past 5 to 10 years. For instance, I can't upload SON OF SAMSON but some channels have that movie because they were uploaded before changes to claims took effect. It's a strange state of limbo. The channel is overwhelmingly viewed by men, with women making just a small percentage of viewership. The list of books covering the subject of the PEPLUM genre keeps growing to the point of saturation. This is sad because I'm seriously thinking of writing my own book. Most of these new books are disappointing (which is no surprise, really). The blog's far reaching success (there were few PEPLUM books before the blog came along) seems to have given the impression to a lot of authors out there that they can cover this subject in a superficial manner and that's good enough since the no one takes the genre seriously. These books need to pass the smelling test, and as the creator of this blog, the information in these books is often quite pitiful. 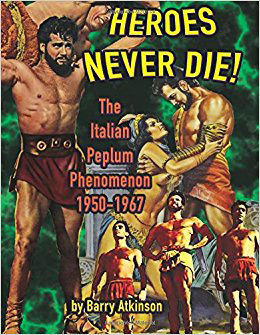 I encourage you to write the definitive book on cinema set in the Ancient World. This should include the great Italian silents of the genre. Your book will almost certainly be the best on this topic. Swashbucklers and Arabian Nights type fantasy movies set in later periods are perhaps material for a second book. 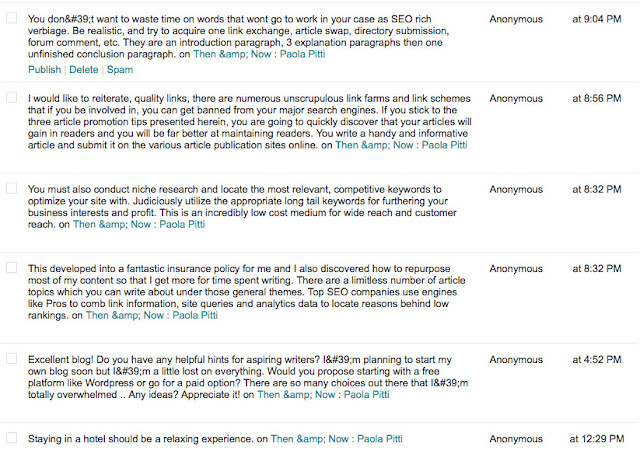 I've had some similar spamming posts over at my blog too, though they've stopped now, it seems. I think a slowly mounting surge of interest in classic peplum cinema (and generally other classic cinema) is at work. It's a result of the Hollywood fatigue that seems to be similarly mounting. Movies today are made for huge sums of money, but the results are often abysmal. Modern movies set in the ancient era are anachronistic in a myriad of ways, and even the common movie goer, with only a slight knowledge of history, is sitting there thinking "that can't be right?" Whatever it is, what made the movies of yesterday so entertaining, is sorely lacking in today's efforts. in the final chapter. Also the writing is repetitious. An editor was sorely needed. It did make me aware of some films I didn't know about. The author often mentions if the movie is available on DVD and because of this I was able to send for DVDs of two of the movies which were new to me. The color edition is worth the extra money as the book has some very nice illustrations. The author does include all the swashbucklers and Arabian Nights movies which is very helpful. Not a great book but certainly not a waste of money either.